This is the sacred place where Nichiren Shonin entered priesthood, and the main temple where he powerfully declared the establishment of a new sect based on the Lotus Sutra (Rikkyo Kaishu). The temple is near Nichiren Shonin’s birthplace in Kominato, a steep climb up Mount Kiyosumi by car. The bracing air is filled with a sense of austerity and profundity appropriate for a sacred place of training. Even though the elevation is only 383 meters, Mount Kiyosumi is the second highest mountain on the Boso Peninsula. As its slopes rise directly from the shoreline, the mountain gives the majestic impression of Mount Hiei. 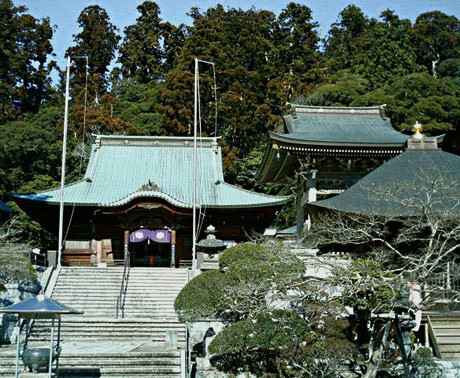 This is no wonder, as Mount Kiyosumi was once revered as one of the most sacred mountains for Tendai Shu and was the grounds for a large temple. The principal deity is Kokuzo Bosatsu, Akasagarbha Bodhisattva, who performs miracles for good fortune and success. On May 12, 1233, at the age of 12, Nichiren Shonin climbed the mountain accompanied by his father. Here, he studied the esoteric Buddhism of Tendai Shu. On October 8, 1239, at the age of 16, he entered the priesthood under the guidance of Dozen, and changed his name to Rencho. Nichiren Shonin once prayed to Akasagarbha Bodhisattva to make him the wisest man in Japan. On the twenty-first day of prayer, he received a precious jewel from an old monk (actually the personification of Akasagarbha Bodhisattva) in a dream. From that day forward, he gave himself over to his studies and training, the path that would lead to his discovering the true teachings of the Lotus Sutra. 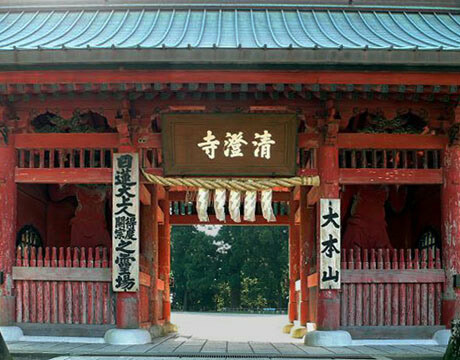 While always keeping Seichoji Temple as a base, Nichiren Shonin went on to study at other places, such as Kamakura, Mount Hiei, Mii Temple, Nara and Koyasan. He studied many things, including esoteric Buddhism, Jodo, Zen and Ritsu Buddhism, but could not discover the true teaching. He continued to study many scriptures, and finally realized that the only true teachings lay in the Lotus Sutra. Nichiren Shonin returned to his mountain, intent on correcting the wrongs of many different sects.